Features 4 Prestan manikins with the unique clamshell design that accommodates an easy-to-insert face shield lung bag, and the new CPR Rate Monitor that provides instant feedback to both students and instructors about the rate of chest compressions! Each manikin also features a patented face/head tilt that simulates the way an actual victim's head would move, for realistic practice in opening the airway during CPR; full chest rise; and a clicker mechanism that helps students learn to use the right amount of force in order to compress the victim's chest to the correct depth. 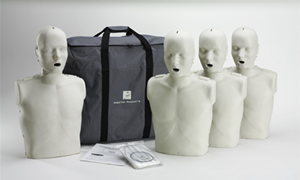 Portable and easy to set up at training sites, the pack comes with 4 manikins, 50 adult/child face shield lung bags, and a nylon carrying case. Comes with 50 A/C face-shield lung bags and a nylon carrying case..